Wheat-Back refers to the arrangement of the spindles running from seat to bow. The wheat style refers to centered spindles running in line through a stretcher, and arching outward as they reach the Windsor bow back top. Wheat-Back spindles are often finer than traditional spindles creating a more elegant and sophisticated feel. This Windsor Dining Chair is available in your choice of Oak, Maple, Brown Maple and Cherry wood with many different stain and paint options. 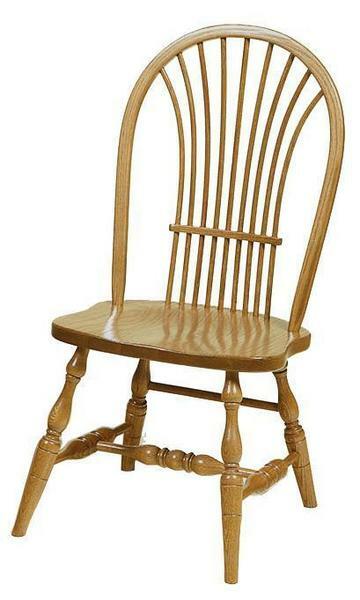 Additionally, the Yorkshire Dining Chair features 3 stretchers and a crossbar for maximum support and durability. To place an order for new Amish made dining chairs or to have a question answered, feel free to give us a call at 1-866-272-6773 or stop by for a visit to our furniture store in Florida.